In the hierarchy of social justice issues, the rights of animals are often ranked at or near the very bottom of the pyramid. Sadly, most people overlook the problems animals face, regarding them less as beings with emotions and desires and more as objects whose central role is to satisfy the needs of humans: food, clothing, scientific advancement, entertainment, companionship, etc. Even the law regards animals as property, with no more rights than a toaster or an old sofa. Yet the law can help protect animals, and organizations around the world are dedicated to creating animal-protection legislation and ensuring that animal abusers are held responsible for their crimes. One such group, the Animal Legal Defense Fund, has just launched a campaign urging states to enact animal-abuser registries that would help keep anyone convicted of felony animal cruelty away from new victims by allowing animal shelters and humane societies to more thoroughly screen potential adopters. Such registries, inspired by Megan’s Law, would also allow the public to discover if animal abusers live in their community. You can learn more about the registry at ExposeAnimalAbusers.org. ALDF’s campaign launch coincides with National Justice for Animals Week (February 21-27), an effort by the nonprofit to educate the public about abuses that have become a hidden epidemic in the US. Throughout the week, ALDF will be posting daily action items, advice on how to recognize and report cruelty to animals and profiles of 2010 National Justice for Animals Week honorees ― district attorneys and other local law enforcement officials who have demonstrated an aggressive commitment to bringing animal abusers to justice. Visit ExposeAnimalAbusers.org to learn more about ALDF’s model law for animal abuser registries. Use the site’s one-click functionality to contact your legislators and urge them to support public registries of convicted animal abusers. Sign ALDF’s Animal Bill of Rights. Support the work of the Animal Legal Defense Fund. I am a warrior, and it is the way of the warrior to fight superior odds. In the battle not only for whales, but for the hearts and minds of the public, the Sea Shepherd Conservation Society is in a class by itself. With the possible exception of PETA, no other animal-rights nonprofit has attracted so much mainstream media attention ― positive or negative ― while shining a spotlight on a single injustice. For Paul Watson and the rest of Sea Shepherd in the Antarctic right now, guarding the whales from Japanese poachers is a matter of life and death. This is Sea Shepherd’s sixth campaign to defend endangered whales in the Southern Ocean Whale Sanctuary, and both sides have raised the stakes with high-tech equipment and more vessels navigating the often hazardous waters. While whaling apologists accuse Sea Shepherd of relying on violent tactics and call them “eco terrorists,” it’s the Japanese whalers who have no qualms about using violence. 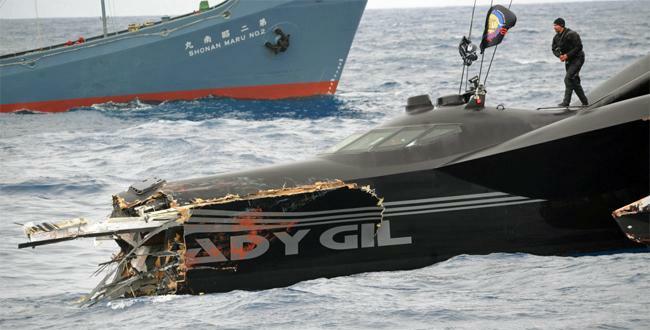 Not only are they killing protected animals, but they’ve deliberately destroyed a Sea Shepherd vessel, injuring a crew member in the process. Of course, we knew from the beginning that the current anti-whaling campaign, named Operation Waltzing Matilda, would be unlike anything we’ve seen before. Last year, with their whaling hunt still months away, the Japanese revealed that in addition to their factory ship, Nisshin Maru, and its catcher boats, this year’s whaling fleet would include at least two government “security vessels.” Their ships are equipped with such cutting-edge weaponry as photonic disruptors and sonic blasters, along with some good old-fashioned water cannons, and they do love to use them on the protesters. This is clearly the most volatile campaign Watson has waged against the Japanese whalers. Just last Saturday, the harpoon ship Yushin Maru 3 rammed another Sea Shepherd ship, the Bob Barker. The Bob Barker was blocking the slipway of the Nisshin Maru, making it impossible for the Japanese to offload and “process” dead whales. The whaler tore a gash three feet long above the waterline in the Bob Barker’s hull; no one was injured this time. Watson, who flies the Jolly Roger and keeps his ships vegan, says “Operation Waltzing Matilda is turning out to be a tough, protracted effort, but I am confident we will once again impact their kill quotas despite the new obstacles thrown at us this year by the whalers.” It’s often these new obstacles that get media attention for Sea Shepherd, which then gains more members and volunteers eager to join the fight. The organization is buoyed by international support for the whales, and it’s in no small part due to the efforts of Sea Shepherd that most Americans are now aware of and opposed to the whale hunt. This season, according to a rep for the Japanese Institute of Cetacean Research (ICR), a front group for the commercial whalers, the whaling fleet is targeting 850 minke whales and 50 fin whales. Though most observers recognize that Japan’s hunting of whales has nothing to do with scientific knowledge (the nation’s foreign minister has confirmed the hunts are motivated by an appetite for whale flesh), they’re still keeping up with the research charade. And what exactly has Japan learned after all its “research”? Last year they discovered that — wait for it — whales eat krill. Apparently, no one in Japan has access to marine reference books, Wikipedia or old Jacques Cousteau documentaries. And after killing hundreds of whales in 2008, ICR announced that injecting whale sperm into a cow does not produce a whale-cow hybrid creature. Directly challenging the notion that you must kill an animal in order to study her, 18 scientists from Australia, France and New Zealand are currently taking part in a 6-week program to research whales, their food and their interaction with the environment. Their non-lethal research techniques include biopsy sampling using retrievable darts, satellite tag tracking, photography, acoustic surveys and whale feces recovery. The Japanese should just scrub that ridiculous “RESEARCH” label from its whaling ships right now.